Denver Vintage Reggae Society aims to bring together all walks of life & music preferences under the banner of not only Reggae, but genuine music & UNITY through individuality. They are a society based around the love for and preservation of 60's/70's reggae. They meet the second Saturday of every month at Tooeys Off Colfax (1521 Marion St., Denver, Colorado 80218 (303)586-5075) to dance and appreciate reggae. Never a cover! Rotating roster of Denver's Best DJs. 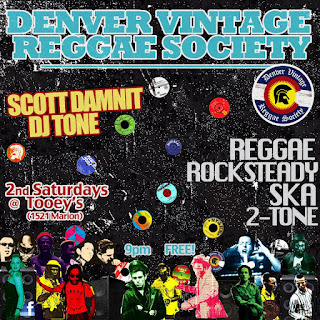 Tonight Scott Damnit & DJ TONE bring you another rockin' DVRS night full of boss, vintage Reggae, Ska, Rocksteady & 2-TONE. This month they'll have new T-Shirts, a new DVRS Comp CD Vol. 2 and an old friend as their Special Guest DJ! See ya at the spot!